Long before the financial meltdown and the red alert on climate change, some far-sighted innovators diagnosed the fatal flaws in an economic system driven by greed and fear. Across the global North and South, diverse people - financial wizards, economists, business people and social activists - have been challenging the "free market" orthodoxy. 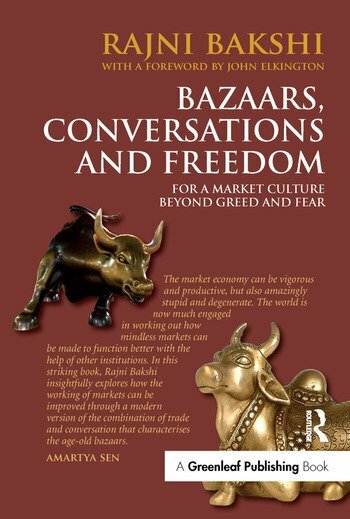 They seek to recover the virtues of bazaars from the tyranny of a market model that emerged about two centuries ago. This widely praised book is a chronicle of their achievements. From Wall Street icon George Soros and VISA card designer Dee Hock we get an insider critique of the malaise. Creators of community currencies and others, like the father of microfinance, Bangladesh's Muhammad Yunus, explore how money can work differently. The doctrine of self-interest is re-examined by looking more closely at Adam Smith through the eyes of Amartya Sen. Mahatma Gandhi's concept of 'Trusteeship' gathers strength as the socially responsible investing phenomenon challenges the power of capital. Pioneers of the open source and free software movement thrive on cooperation to drive innovation. The Dalai Lama and Ela Bhatt demonstrate that it is possible to compete compassionately and to nurture a more mindful market culture.